Shouldn’t Texas adoptee rights be a huge priority in the Lone Star State? Don’t we brag that everything here is bigger and better? 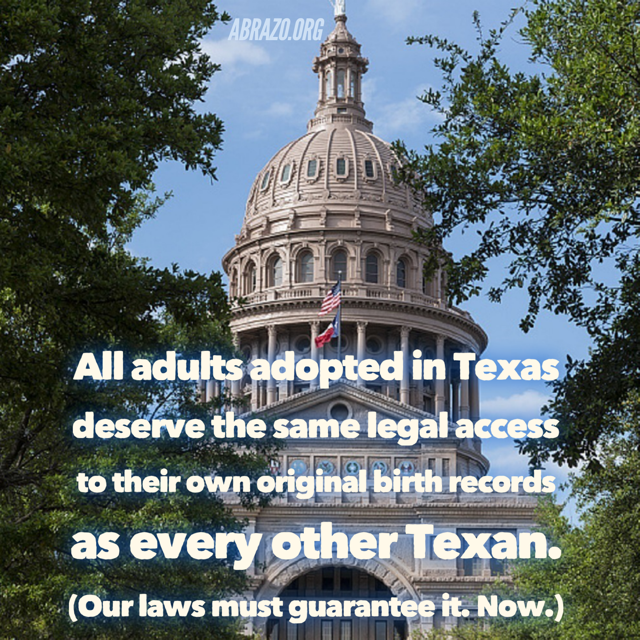 We wish we could say Texas adoptee rights are a civil rights priority for all our state lawmakers. After all, we Texans like our freedoms. And given our Southern border and the immigration reform issues, why wouldn’t proof of identity be a big thing here? Surely every American-born citizen has the right to obtain an unaltered/non-falsified copy of their original birth certificate, right? Wrong. Most adults born and adopted in the United States find their rights to access their original birth certificate (OBC) are legally-restricted. State laws sharply govern if, when and how adoptees are “entitled” to the facts of their own birth. (Their. Own. Birth.) All because they were once adopted, long before they even knew about it. Governor Greg Abbott and his wife are adoptive parents. So are State Representative John Lujan and his wife, State Representative James Frank and his wife, State Senator Donna Campbell, and Railroad Commission Chairwoman Christi Craddick.. Lt. Gov. Dan Patrick even launched an initiative to promote foster care and adoptions in the State of Texas. These are intelligent, well-respected state leaders. So surely all these folks support Texas adoptee rights, too, right? Not so fast. When it comes to the Texas Legislature, there’s an apparent disconnect between promoting adoption and supporting adoptee rights. Every two years, a small organization called S.T.A.R. (Support Texas Adoptees Rights) rallies to persuade the Texas Legislature to implement open adoption records laws. This would go a long way towards upholding Texas adoptee rights in this state. Abrazo supports S.T.A.R. wholeheartedly, and joins in its campaign at the State Capitol every other year. Ethical lawmakers like State Representative Joseph Deshotel and Senator Brandon Creighton have sponsored proposed adoptee rights’ bills in Texas years past, only to see them foiled by those with opposing agendas. This means that countless aging adoptees continue to wait year after year for the State of Texas to uphold their civil rights. This leaves them little choice but to pay for costly DNA testing. It’s a last-ditch effort to find their genetic links on their own, without having to obtain a court order to open their adoption files. This is just wrong, and it shouldn’t be okay. Grown adults should be able to access the legal facts of their own beginnings. And it shouldn’t cost them more or take them any longer just because they were once adopted. Please join Abrazo in advocating for Texas adoptee rights! Support the work of S.T.A.R.. Ask your Texas lawmakers to take action. Adoptee rights and OBC access are long-overdue in the Lone Star State, and it’s time to right this wrong.